The Selecta II offers you all the advantages of a premium SLT product, with true portability and optimal space utilization. 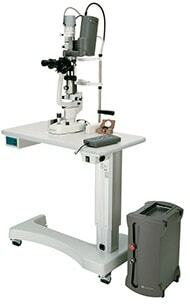 The Selecta II is a clip-on product, conveniently fitting onto most commercially available convergingoptics style slit lamps. 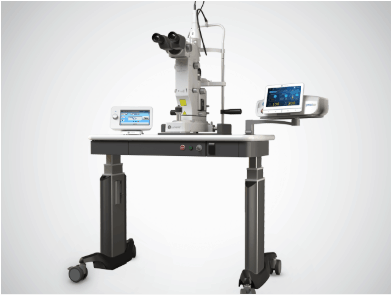 The unique design of the unit’s laser head makes for especially easy system attachment and disconnect, allowing physicians to use the slit lamp as a diagnostic tool, an advanced laser delivery device or both. The Selecta II is compatible with your preferred Slit Lamp, allowing you to diagnose and treat with your unit of choice. 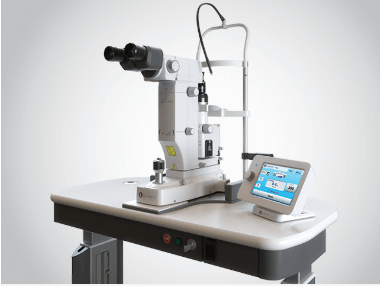 The Selecta II is compatible with most commercially available converging-optics style slit lamps, capitalizing on their enhanced visualization capabilities of the anterior segment. Weighing only 25 lbs. (11.5 Kg), the Selecta II can be easily transported from one location to another, maximizing your investment. The Selecta II is a clip on laser, compatible with most commercially available converging-optics style slit lamps. 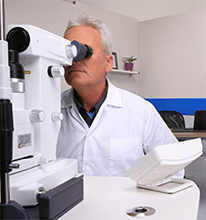 Easily connect it to your existing diagnostic slit lamp to perform SLT and stow away at the end the procedure or scheduled laser sessions. Selective Laser Trabeculoplasty (SLT) technology was developed and brought to market by Lumenis, based on the work of Dr. Mark Latina, MD, et.al. Today, Lumenis prides itself as the company with the most robust clinical data on SLT, the largest global installed-base of SLT products, the widest range of added-value products & services to maximize SLT potential in your practice – including robust patient education collateral & multimedia – and much more! When you buy an SLT product from Lumenis, you gain immediate access to the largest network of SLT users worldwide, receive product upgrades & updates, advance-notice invitations to SLT symposia & workshops all around the world and a long list of other benefits which are exclusive to Lumenis SLT customers. Furthermore, all Lumenis SLT products were designed to meet the clinically recommended SLT treatment protocol that we have helped to shape. Buying a Lumenis SLT product guarantees your ability to customize treatment on a case-by-case basis and meet SLT treatment protocol requirements. Selective Laser Trabeculoplasty (SLT) is a clinically proven laser treatment to reduce IOP without coagulating the Trabecular Meshwork. SLT represents an evolution over previous laser therapies as it can be safely repeated if needed. Our passion for opthalmic lasers date back more than 40 years! At Lumenis, we truly understand multi-wavelength photo-coagulation-technology; that is after all only one of the privileges reserved for the foremost pioneer in this field. It is also precisely the reason why the decisive majority of general ophthalmologists and retina specialists around the globe have actively chosen to purchase Lumenis multi-color lasers – making Lumenis the global market leader and the company with the largest installed-base of multi-color ophthalmic laser products worldwide.